To most riders, 700 kilometers in a day seems like too much. For some riders, even 200 sound like too much. It shouldn't. If you are in reasonable shape, covering 500 to 600 kilometers in a day of riding on the open road or 300 odd kilometers in the hills should not be too strenuous. Riding long distance entails a re-calibration of your fatigue threshold. Like the 'second wind' experienced by a marathon runner, long hours in the saddle reveal similar reserves that exist within us. 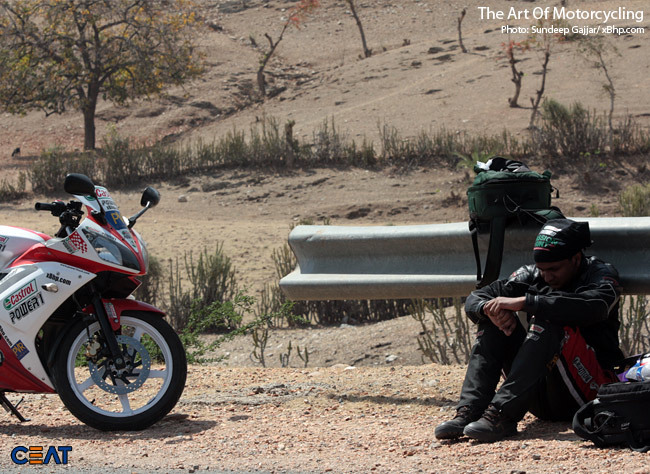 Usually, after 5 hours on the road, nearly every rider feels tired. Yet, pushing oneself even an hour beyond this apparent tiredness shows quite clearly that it will not get any worse. The body may feel a need to rest but the mind can push it on for twice that time without damage. The trick is in keeping your eyes on the target and paying attention to details. 1. Keep your bike in top mechanical condition. A failure 2 days into the tour and in the middle of nowhere is a thoroughly avoidable event. The engine tuning, control cables, brake pads and fluid, tyres, electricals, drive chain and even the frame need periodic checks. 2. Carry all the relevant documents in original, with a photocopy placed elsewhere. The R/C Book, Pollution certificate and Insurance policy (even the cover note will suffice). 3. Being in a reasonably fit physical shape helps the rider stay alert even at the end of a 10-hour ride. Fitness stretches one's fatigue threshold. 4. Plan your route, along with any alternatives, and calculate equipment and financial requirements according to the longest probable route. Good road maps are a must. Especially the ones that show distances (with heights in case of hills) accurately and mark petrol pumps that actually exist. Being stranded without fuel is depressing at the best and life threatening at worst if you get caught at high altitude late in the day and without equipment to spend the night in the open. 5. 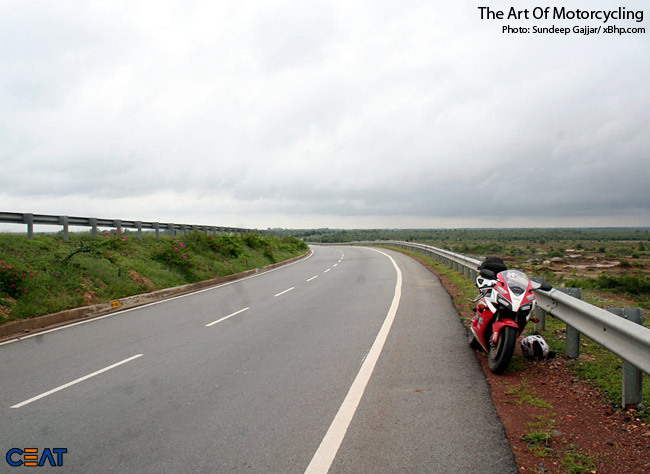 On highways within our country, doing about 200 kms stretches between breaks is usually the limit. 6. Carry only as much luggage as is totally essential, but never skimp on tools and repair equipment. Carry all that you would need, short of towing another similar bike behind you. Tie the luggage securely on the bike. If riding one-up, tie it on the seat behind as it gives your back some added support and stops the wind from getting in from behind you. 7. Tie the bag so tight that it cannot be moved sideways or up and down at all. A loosely tied bag will keep sliding this way or that and apart from distracting you, could act as a pendulous mass in case of a rear wheel slide during panic stops. Being well behind the centre of gravity of the bike, even a 15kg bag could exert enough leverage to make the otherwise controllable slide totally wild. 8. Prefer a bag with side pockets that are not covered by the tie-down straps. Keep the frequently needed stuff like the water bottle, small tool kit, the first aid kit, spare goggles etc in them. Pack the bag such that the heavier things are at the bottom and the lighter ones on top. Keep extra clothes and rain gear outside the bag. Secure it on top with bungee cords or elastic net. Don't forget to wrap these things in a polythene bag first or the dust and grime enroute would not leave them worth wearing. 9. Keep a separate helmet at home for exclusive use during the long tours. Make sure its visor is clean, scratch-free and seals out the dust effectively. Following a truck or bus on a narrow and dusty mountain road at slow speed will prove you its real worth. Photo: Keeping the visor clean is very important. 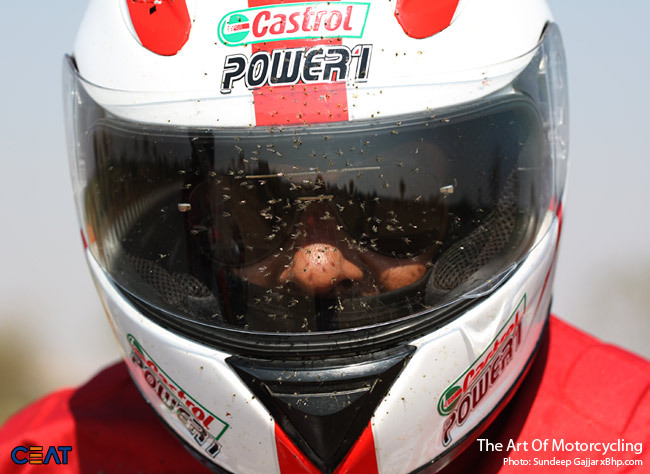 Be wary of venings when there are a lot of bugs flying and splattering on your visor. 10. Wear a cotton or silk balaclava before putting on the helmet, whatever the weather. It protects the inside of your helmet from oily perspiration and stops insects from getting into your ears and nose if you need to ride with the visor open. Two thin cotton balaclavas inside a well fitting helmet can see you through the coldest ride. 11. Wear a cotton inner in summer (a cotton track suit is ideal), and preferably a wool one in winter. Au outer windproof jacket with a closed collar is useful, whatever the season. Even 20degC summer mornings can be uncomfortably cold when doing a 100-kmph for hours together. (Remember the wind-chill factor). Also, when riding in those hot summers, contrary to instinct, cover yourself well, leaving as little skin exposed as possible. The dry hot wind blows away perspiration before it can cool you and since every bit of liquid near the skin gets dried up almost immediately, you get dehydrated pretty soon. Clothes help retain this water. And keep drinking water or cold drinks frequently. 12. For cold weather riding, dress in layers comprising of wool, cotton and wind-proofs. A layer of cotton inners followed by a wool tracksuit, then a thin windproof jacket, which in turn is covered, by a heavier quilted windproof jacket can take you through sub-zero riding conditions. Gloves are a must but of the kind that don't compromise on feel and grip, whether wet or dry. To avoid wind-chilled hands in winters, wear latex rubber surgical gloves over woolen ones. Leather though, is ideal. Improvise a nape cover for the gloves using a non-slip type polythene bag. 13. Dress your lower extremities the same way as the top. Two layers, one cotton and the other wool followed by good windproof pants that close around the ankles are sufficient. Boots should have thick non-slip rubber soles, a metal reinforced toe cap and should reach above the ankles. 14. A set of dark glasses for bright sunlight and clear one's for night riding, are important. Needless to say, they should be scratch-free and a good fit. 15. The rain suit should be made of rubberised cloth and its seams must be double sealed, pasted together and not stitched. The stitch-holes will leak, no matter what the manufacturer claims. 16. However far or near the destination, try to leave early in the morning, pre dawn preferably. The sight of a new day breaking, while you ride, is somehow very rejuvenating. And the added benefit is of very little traffic so early in the day. 17. Take frequent breaks, at least every 2 hours, when on a long ride. After 10 hrs on the saddle, you might need to stop even more frequently, to fight fatigue. When riding in the cold, take frequent breaks for warm food and drinks. Do not keep riding until you get numb. You could be closer to hypothermia than you realise and could crash from delayed reactions. Photo: Take frequent rests, remember its better to be late than to me Mr. Late! 18. Drink lots of water on the way. The wind rushing past carries away more water from the rider's body than he would loose if walking or travelling in a covered vehicle. In cold weather, tea and coffee are good substitutes but for the frequent toilet breaks, since both of these are diuretics. 19. Keep a fuel log. It helps you monitor the mileage your bike is giving apart from keeping the fuel expenses in the picture. In areas where fuel stations are far and apart, you can easily assess whether you can make the distance or not. 20. Maintain a steady fast pace for long stretches. Rushing along for sometime and then stopping every hour will actually reduce the ultimate distance you cover in a given time span. Remember the Hare and the Tortoise! 21. Wrap sandwiches or paranthas in aluminum foil and clamp it somewhere on the engine casing. You get hot food whenever you stop for a tea break! A real treat in those chilling winter rides. 22. Ride the long road with the attitude of someone on a holiday. Leave that poisonous urban rush behind. Set a target for the day but don't keep chasing it all day. Relax! You are out for fun. Photo: Be a tourist, not a man in a hurry. Absorb the beauty of your surroundings. 23. When in the hills, keep to your side and watch out for gravel, oil, water or pine needles on the inside of blind curves. In winter, during frosting conditions, watch out for the treacherous 'black ice'. Water or even moisture on the road gets frozen into clear ice and it is very-very slippery. This happens even on a bright sunny afternoon on the shady side of the mountain. 24. With snow or a crust of crunchy ice on the road, a bike ridden two up is more stable than with a single rider. Due to the added weight, the wheels an cut through the ice to grip the road. 25. If there's a stream flowing across the road, watch for slippery moss covered rocks underneath. Keep the bike upright and avoid sudden direction changes. Photo: Cross a stream with care, especially in the mountains. 26. Night riding in the hills is, in a sense, safer than during daytime. You can see the approaching vehicle's lights beyond a curve. Also, you are more focussed since all you can see is what gets lit up by the headlight. There are no distracting views to see around. Prefer a headlamp that gives a wide beam spread as it enables you to see which way the road goes beyond a curve. A narrow focus beam lets you see straight ahead but not where the road is heading beyond the turn. 27. Night riding in the plains is a different ball-game. Follow a fast 4 wheeler at a safe distance and use its lights to see ahead. A bike is not the king of the road at night. 28. Practice doing minor repairs, in darkness, or with your eyes closed. Things like changing the control cables, the headlight bulb or the spark plug. You could get stuck with any of these failures in total darkness. 29. Always carry a spare tube even if you have puncture patches. And, before hitting the road, check the expiry of those puncture patches and adhesive. In case of sudden deflation of a tyre while riding at speed, never brake the punctured wheel. The tyre will jump the rim and you get thrown off the bike. 30. A couple of meters length of insulated wire and insulation tape are indispensable for on the spot electrical repairs. 31. Carry a 12ft X 16ft plastic sheet. It works as an emergency rain shelter. Put it across the seats of two bikes parked parallel with a 5ft gap in between for you to sit. You get an instant roof and the luggage gets added protection from rain. Keep a stout rope, about 15ft long, for emergency towing. 32. As a ritual, check engine oil, brakes, control cables, chain tension and lights each day before starting. Keeps you in touch with the bike and you are not easily caught by a surprising failure. 33. Intersections are popular places for spills. Keep that head on the swivel and preferably let another vehicle run interference between you and the cross traffic. Let him take the hit if some moron jumps the light. Any larger vehicle is far better equipped to take on impacts than an exposed motorcyclist. 34. Passing a bus that has pulled over at a stop, look at the road ahead of its front tyre from under its bumper for brave pedestrians who believe in crossing in front of a parked bus! 35. With disc brakes common, the increased braking power could get translated into a rear end collision if you brake hard and surprise a tailgating motorist. So watch those mirrors before dropping anchor. 36. Alcohol is a great deluder. It makes you feel strong when you are weak, capable when your abilities are diminished. Maybe that's the attraction behind it. Don't, please don't mix alcohol with 2-wheeler riding. Since the 'robot skills' of starting, stopping and steering are not much affected, the drinker is deluded into believing that all his reflexes and riding faculties are intact. Not so. Even � a bottle of beer (that’s just 5% blood alcohol level, half of the legal limit) just takes away the rider's ability to cope with the unexpected. And mishaps are unexpected. 37. Stitch a piece of chamois leather to the back of your left glove's fore finger. A quick wipe across the visor in rain improves vision substantially. 39. When riding in a strong crosswind, crouch to make yourself as small a target for the wind as possible. Tuck in your arms, narrow your shoulders, bend your back, slide back on the seat to get your head close to the tank and grab the tank with your knees. In short, shrink. And turn into putty. Relax your body and retain a firm yet resilient relationship with the bike. Let your body move a bit with every gust and absorb its energy on its own without shaking up the bike. And watch for sudden changes in the wind force due to static (trees, houses) and moving (cars, trucks, buses) windbreaks. They stop the wind as you pass them and it comes back in force suddenly when you are past them. 40. Fatigue is one major factor that can result in lax reflexes and diminished ability of the eyes to focus. Rest, if possible. If not, then concentrate on focussing on distant objects to avoid falling into the trap of focussing on 'nothing' in front of you, the 'seeing yet not seeing' syndrome. And keep those eyes moving. Take a short break or a nap when sleepy. Driving drunk or drowsy is the same. Photo: Take a powernap for 5-10 minutes in case of heavy fatigue. Riding with fatigue is a sure call for disaster. 41. Develop peripheral vision, that ability to be aware of what's going on in the far edges of your sight while looking straight ahead. While riding, fix your eyes on the road and traffic ahead and without moving your head, try to monitor the traffic on either side of you. We usually sacrifice side vision when we concentrate on what's ahead. 42. Braking performance is degraded when carrying a passenger, mainly because the added weight lengthens the stopping distance. Same with cornering. The extra weight takes up suspension travel and makes the bike less responsive to steering inputs. So take it easy when tow-up and extend those safety margins. 43. The passenger should hold on to the riders waist or lower chest. Grab rails leave the passengers wobbly, making the bike unsteady. Tell the passenger to look over your inside shoulder, stay in line with the bike, hold on to you and relax. 44. To cover long distances in a day, the first rule is to keep moving. Don't dawdle over lunch and tea breaks. Minimize your stops by combining tasks. Take a leak, drink water, change your jacket and tighten the luggage in one go. The second rule is to keep the stops short. Maintain a steady fast pace balancing the time gained against the risk factors. At the end of 100 kms, doing 95 instead of 85 makes you gain some 15 odd minutes. Which is about an hour less on a 400km ride. See if it is worth pushing yourself and your bike so close to the limits to gain just an hour in 8 hours of riding. 45. 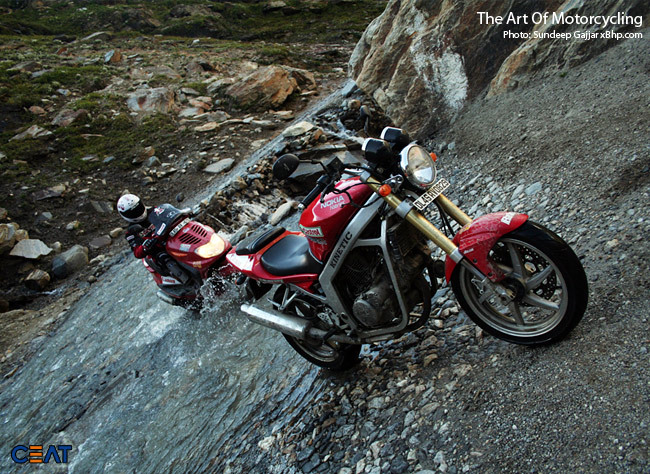 When riding through deep water that submerges the exhaust pipe, keep the bike in first gear and those RPM's up. If the engine stops, water will enter the tailpipe and maybe enter the engine. Do not attempt to re-start the engine as the water inside can severely damage it. 46. 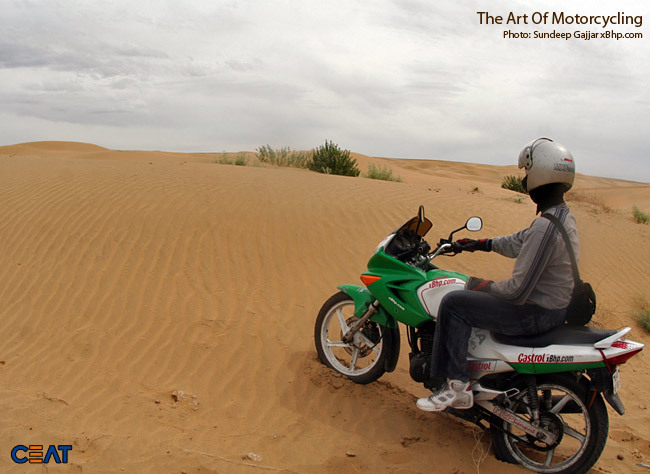 When riding through sand, drop tyre pressures by upto 40% (The idea here is to improve tyre floatation i.e. its ability to ride on top of the sand through increasing the contact patch), keep the bike in low gears and steer straight. In sand, always remember that the wheels have a tendency to dig in, so when coming to a halt, do so gently or the sand piles up ahead of the front wheel making the subsequent pick-up difficult. Photo: Sand is a different ball game together. Riding on sand dunes is definitely not recommended a road bike with road tyres! 47. Keep a 2-mtr long piece of fuel pipe for emergency fuel transfers from one vehicle to another. Also, have a flat board of wood, about 12"X8" handy, to put under the main stand if you need to park your bike on soft ground. Otherwise, use only the side-stand, with a small flat rock placed under it, for parking on soft ground. Note: What appears to be hard ground now could become soft after even a short rain shower. Even hard tarmac becomes unusually soft on a very hot afternoon. 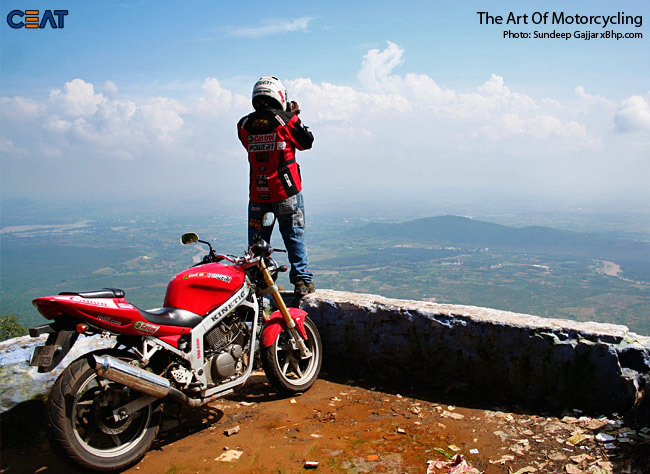 Travel the high road on a motorcycle for the fun of travelling. The highways are not proving grounds for speed and tricks. They are means of getting to far off places. Respect and be considerate for other road users, especially the villagers who were there before the highways came into being. Leave 'Mr. Hurry' and 'Miss Speeding' behind when you tie those bags. Wear your helmet, eye protection and proper safety gear. Just savour the freedom your mechanical steed provides you with and ride so that you can ride again and again. Want to add to this article? Great! But please don't start repeating what has already been stated here. And people who post subsequent to additions by others are advised to go through these additional posts too and not repeat whatever has already been said. Only comments which add on value to the article will be approved. You may add on more points, pointers to the subject relating to this article. a_poor_blind_kid, 747anwar, Da1AnOnlyHermit and 21 others like this. wat is the ideal speed for cruising on any bike?? Use the bike at some 80% of its peak capability and you can use it till the cows come home without any problems. What I mean is this: suppose the top speed of your bike is 100kph. Ride it at or below 80kph and you can do it till as long as you want. No issues. shardul, koolsantosh22, amixt and 3 others like this. i believe carrying a small torch along in a tank bag or backpack is a good option in this case.by small torch i meant a torch which can be be held in the mouth without any difficulty so that the hands are free for the repair work. another advantage is we need not take the map to the headlight everytime need arises to look at the map.just take out the map and shine the torch.during a pee break it can be used to guide us and inspect the surrounding to prevent stepping on things that you want to avoid.lastly in the hilly regions we may come across powercuts moreoften than what we see in the cities and for those moments a torch can come handy. lastly if you are travelling in india, keep a good mosquito repellant cream with you.malaria is very common in the hilly regions of our country. a_poor_blind_kid and MukundRao like this.
" if WRONG is a T-shirt ; then wearing it inside out doesn't make it RIGHT "
Old Fox sir don't you think cruising at 80% peak capability of engine,will give us low fuel efficiency on long run.? Zyan, the context here is to do with touring. Engines of our small capacity bikes, the likes of which most of us use for touring here, give their best fuel efficiency at speeds in the 40-60 kph bracket. Riding long distance is about safe yet quick distance travel and speeds somewhat higher than those that give max. mileage are common for covering long distances in reasonable time. So there shall be a definite drop in FE though its somewhat offset by the steady speeds that highways allow compared to urban usage. Would like to point out that these days an insurance cover note alone does not suffice... I was told by a cop to carry a copy of the original policy itself as they no longer 'count' cover notes. Thats a good point. The 'cover note' in any case has a time-limited validity. It would suffice for the first few weeks as at times insurance companies (esp those in the public sector) take a while in mailing the insurance policy but if the cover note is pre-dated a month or more, the cops can and will insist on the original policy. On the highways,while overtaking vehicles from the left i.e. when they stick to the right lane( on a 4 lane highway, On a two lane road,never ever overtake from the left what so ever ),be aware that most of the times there are people coming in the wrong direction on the edge of the road or for our bad luck on the road.So always make sure the way is clear before pulling next to a vehicle for overtaking. This is a amazing thread for those tourers out there to revise things in their mind before heading out there to have fun. a_poor_blind_kid and Hunterkol like this. these are my observatoins from y recent 1500 km ride. 2) in some places you find share autos going on highways be very very careful , these monkeys[not all] absolutely don't know road manners can surprise you with sudden turns while you are overtaking. Again good amount of horn and slow down. 3) Be aware of small kids playing on road sides in villages they will come from nowhere like super man and rest you know what happens. Here cant help much solely depends on ourselves need to be real slow in villages 30-40 max ,we even cant scold them kids are KIDS . By unspoken91 in forum Help Me! By hackergaurav in forum Who Are You? how to plan a long trip?? By rohitnessaja in forum Help Me! [Photo Feature]: My first LONG drive !!! By punjabi punk in forum Who Are You?